First, I drew up my “wish list”. This was fun as I never get to be the client! I knew that I wanted an almost monochromatic color palette – mostly greens and whites. Something in bloom in almost every season. And of course, an abundance of plant material to cut and bring indoors, without leaving “holes” in the garden. But, like most projects, there were challenges too. 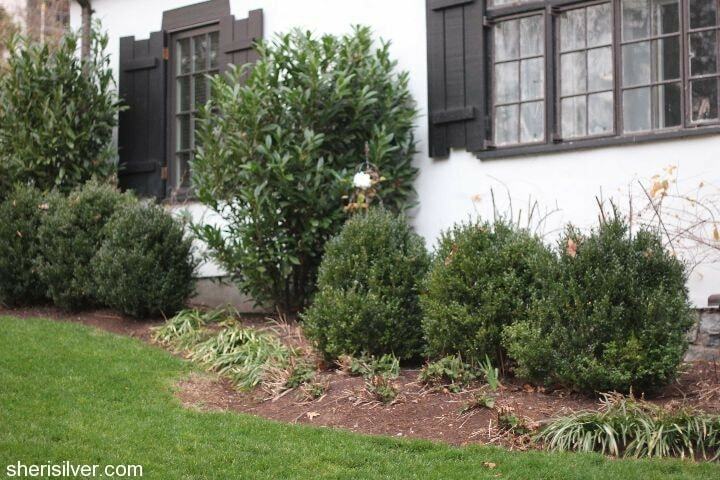 Since this was a “front of the house” garden (also called a foundation garden), there would need to be some evergreens. 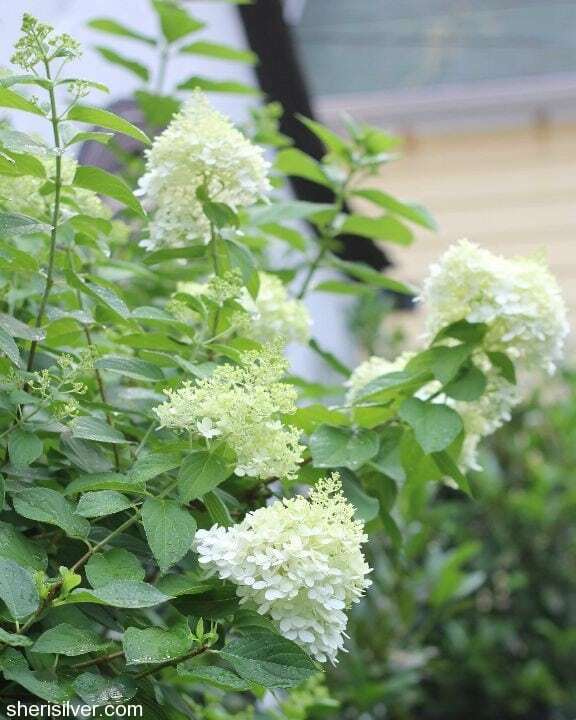 And while I know that they are important to the garden – providing height, structure and year round greenery – they also take up valuable space. As this bed was just about 25 feet wide, I knew that I’d have to select the balance of the plants carefully, to make the most of what little room was left. As you can see, the garden would be pretty barren without them. 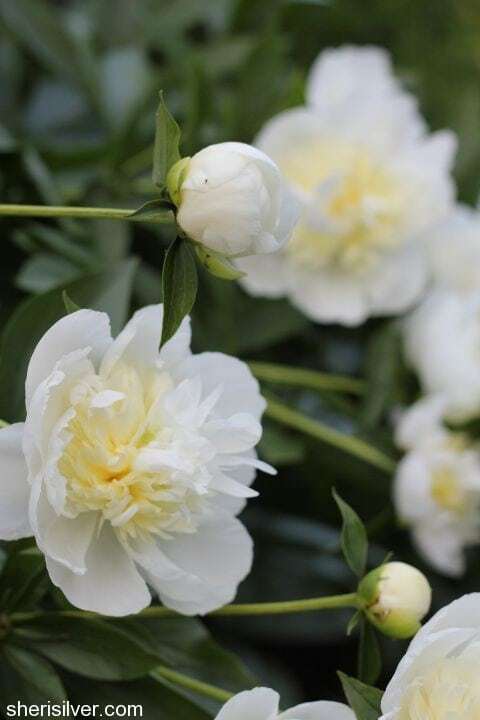 They flower profusely all summer long with pale green blooms, and look gorgeous in a tall vase. Now for the perennials. I decided to pick one variety for every season, and plant lots of each type. 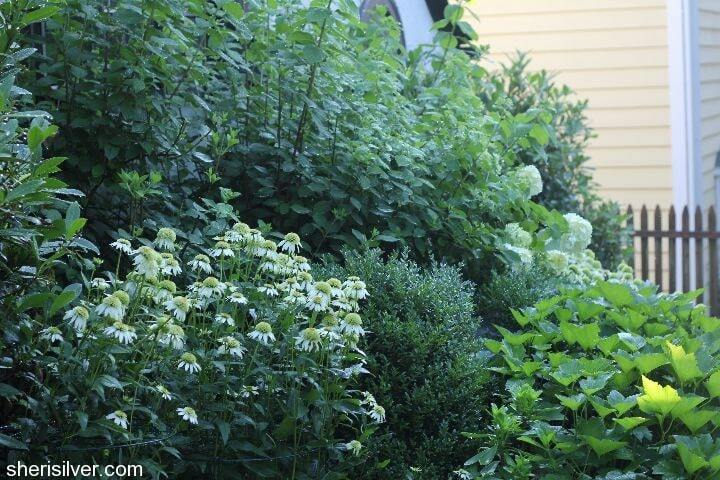 I have two more tips for getting as much “wow” in the garden as possible – even when space is tight. The first is: spring bulbs. 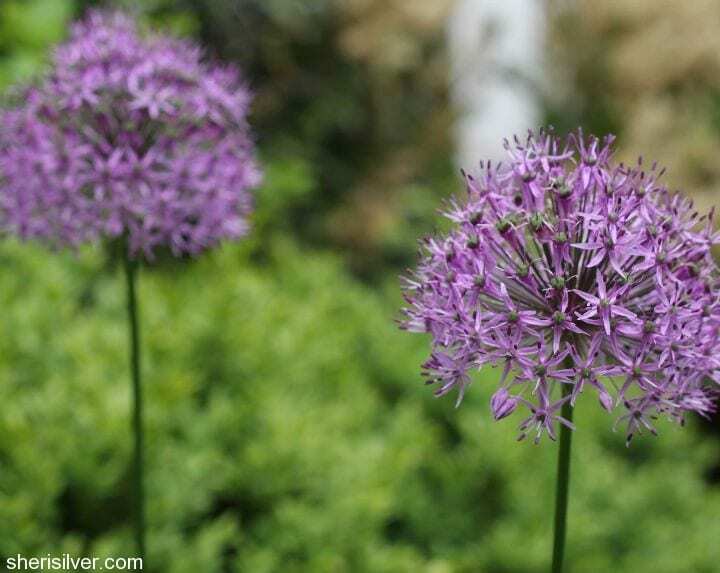 Bulbs take up next to no room, yet provide tons of impact in the garden – typically before anything else is in bloom. 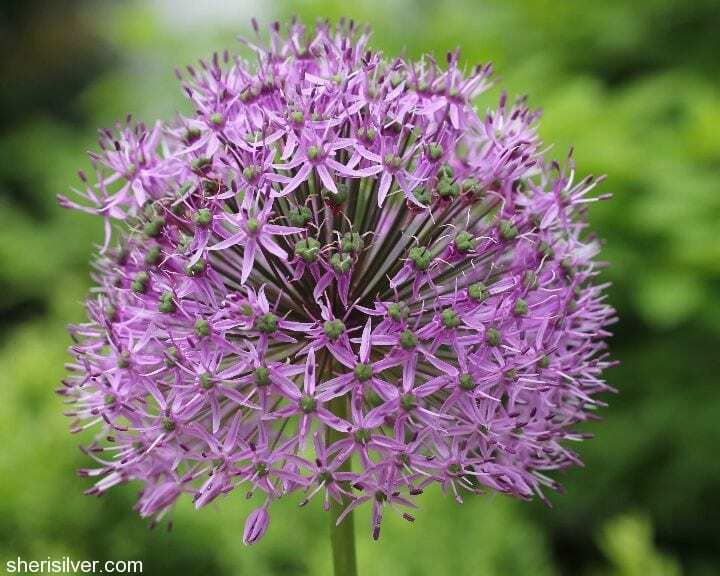 I’m partial to alliums and planted 50 of them. They are so striking, don’t you think? I departed from my green/white color scheme here, but breaking the rules is part of the fun……. The second tip is to plant vertically. 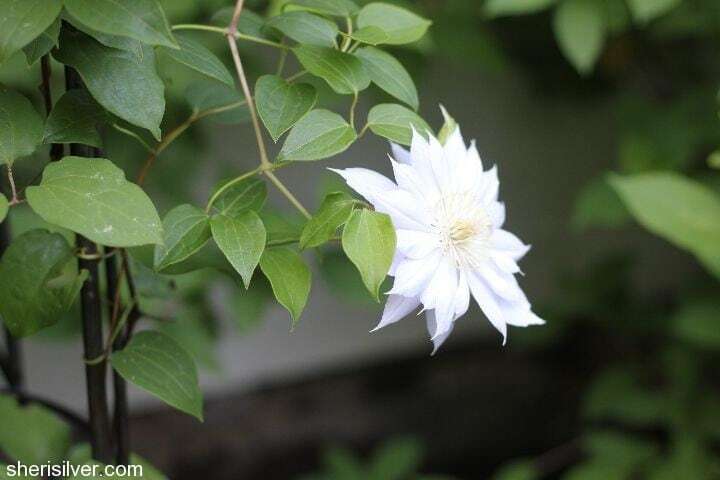 Planting climbers is a good tactic for any garden, but particularly for smaller ones. 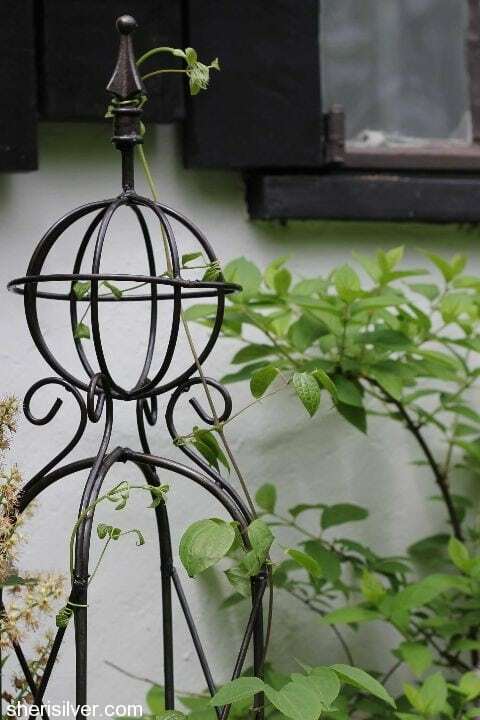 The climbing structures (or “tuteurs”) provide their own ornamental element to the garden, while taking up very little space. 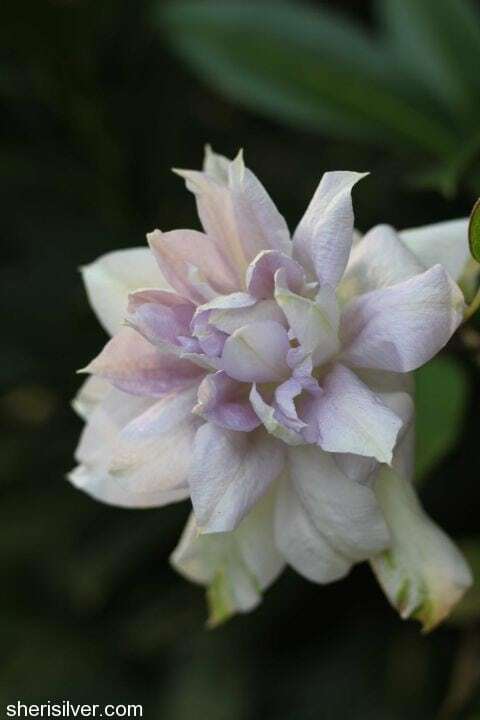 And the clematis that climb up and around them produce enormous white blooms that look beautiful floating in a clear glass bowl. Win-win. 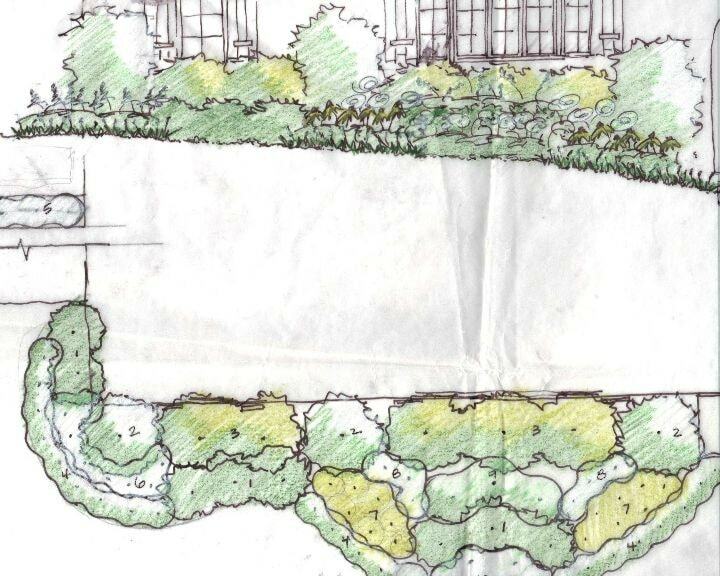 So there you have it – a “proper” foundation garden, lots of flowers for cutting, and something in bloom almost year round. And, in keeping with my “most important rule” – I have a garden that I love. One that make ME happy. How about you? What is in your “dream” garden (either real or imagined)? Do you have any challenges in getting there? Send them to me! Beautiful! I love tending to my garden. I dream of having a English flower garden one day. Right now, I gush over all my patio flowers. 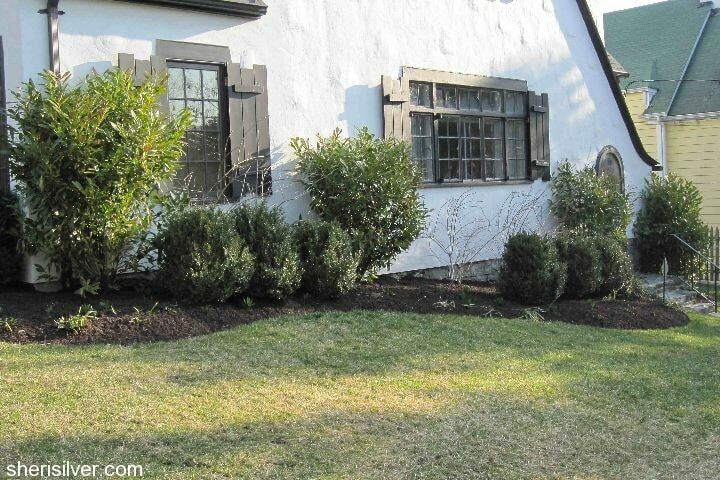 Sheri, please continue to share bits of landscaping tips – I love these posts! You should have seen my excitement, when I got to the Spring Bulbs part. I’ve been admiring them in our neighborhood and want to plant some in our front yard, but didn’t have a clue what they were called. They are so very pretty and truly stunning! Thank you for sharing these tips – I know I’ll be coming back to these posts. Have a wonderful weekend! Sheri, Everything you touch has a perfect balance of precision and whimsy. I don’t know how you pull it off. True magic. And I agree with Lisa! I always hold back my landscaping questions because it feels the same as asking a lawyer friend for free legal advice. I am so going to send you a picture of my steep incline front garden! I am impressed with those ““Limelight” one……. 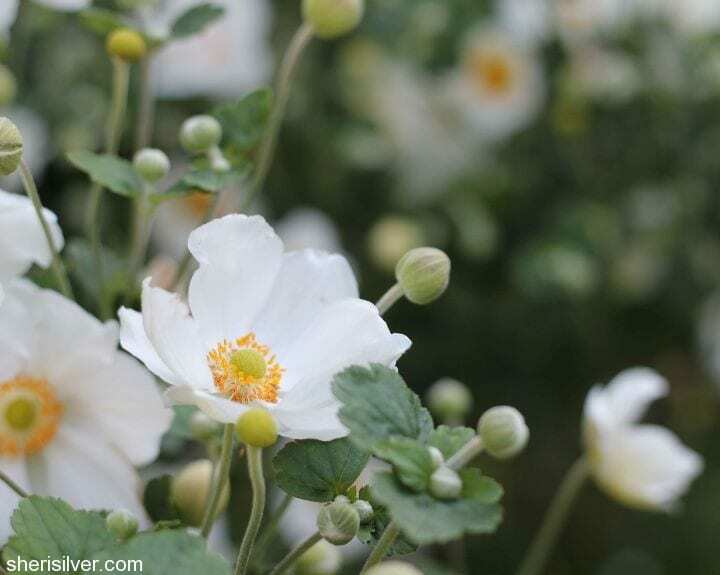 It seems you are big fan of white (light color) flowers. 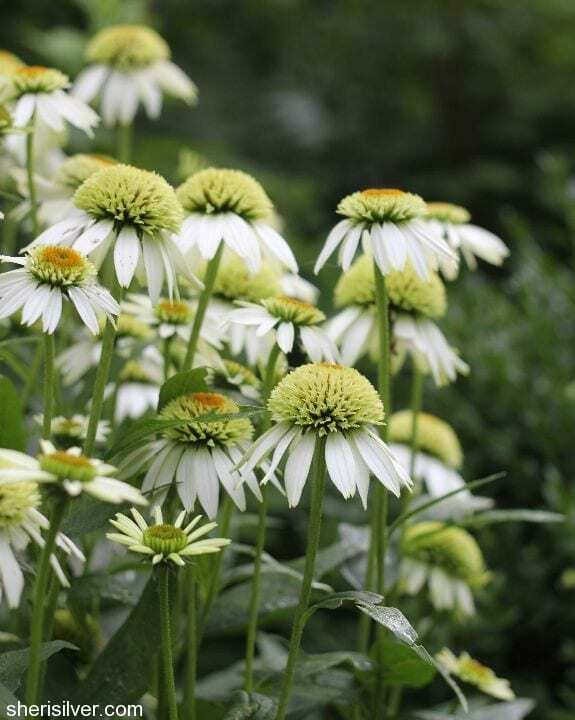 The flowers look alluring, should inspire many people to have more flora in their gardens. Thanks for the post and please provide more posts like this in future. Good luck! thank you, much appreciated. Also, the number at the tip of the large curve and just below #1 and between two groupings of #4 is not visible. What is that plant? 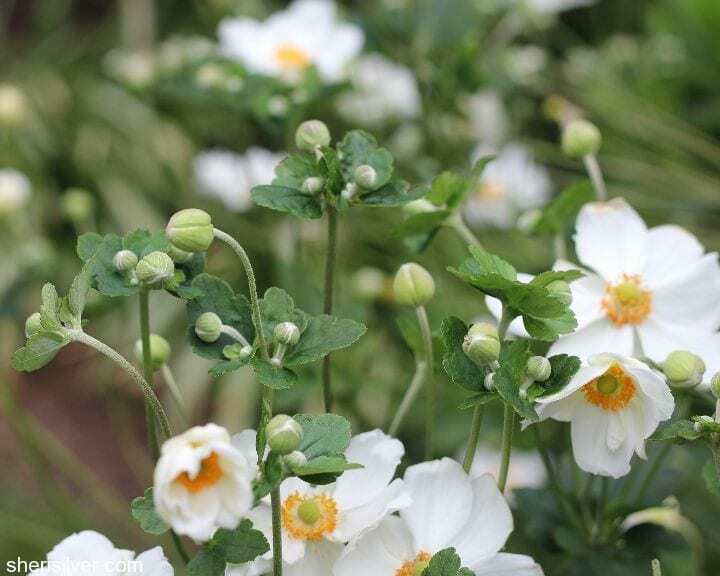 That is the Japanese Anemone! New to your blog and love your suggestions. Can you provide the legend for your garden? What each number is which plant? Looking to get my front yard in order. I live in Southern California and the HOA has done a terrible job and i need to work on it myself. Thanks! Thank You! I am going to tackle the front garden with these..